I really love this time of year—after all, its gardening season! Maybe it’s not a coincidence that the very first man was placed in a garden and given the responsibility of tending and keeping it. The garden was going to be his university, chautauqua or dojo—his sandbox, to teach him about life. In order to learn to function and do practical things he would need more than just “book knowledge” or facts and figures (names of animals, plants etc.). The garden provided the perfect environment to teach him PRINCIPLES—the rules or regulations for life. Today, as our very first entry in our Character-Quest Journal I want to propose the following thesis: Creating a happy, abundant, meaningful life is much like growing a garden. The most important principles of one carry beautifully over into the other. Since this is a pretty bold statement, I’d like to spend the next few lines explaining how. Like I was saying, the purpose of the garden is to create an environment suited for nurturing specific plants that we choose while keeping the weeds and other critters out. This can only be accomplished through careful planning and hard work. The soil has to be broken apart, the clods tilled, rocks removed and raked free of clumps until finally we’re left with a canvas of fresh powdered dirt on which to create our masterpiece. Now, this is important: We have to plant the seeds of the specific fruits and veggies that we want to grow. If we want beans in our garden then we have to plant bean seeds…they’re simply not going to get in there any other way. (BTW, if we plant bean seeds and they sprout eggplants then its time for us to change gardening supply companies…) Oh yeah, on a side note: Maybe we’re not fond of eggplant. However, if we know our spouse or neighbor loves eggplant then it would probably pay off for us to go ahead and plant some in the garden. 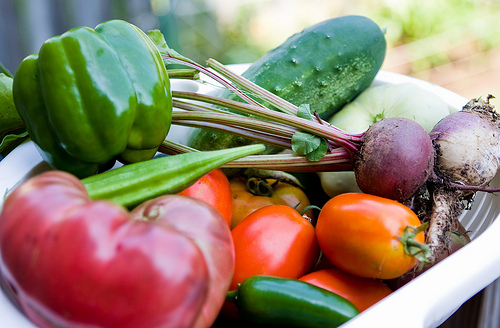 You’d be surprised at the doors that will open for you when you appear with a sack full of fresh veggies in hand. 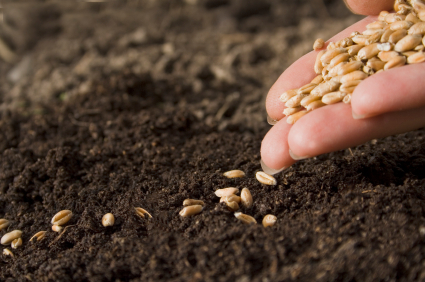 Next, we have to understand that the seeds that we plant one day do not just materialize bearing fruit the next. A lot of planning, bodily fluids and patience are required before we can ever taste the first results. The principle of harvest says: FIRST we sow THEN we reap—the hard effort must be put in up front and then comes the sweet reward. But boy is the investment worth it! The taste of a vine-ripened tomato will beat anything the supermarket has on their shelves any day of the week! My point is this: There is a PRICE paid for quality fruit—and that price is vastly higher than it is for its supermarket-shelf knockoffs. However, built into that extra cost is tuition to a very special school—a charter school about succeeding in life. It seems that the further that our society becomes removed from the soil the harder it is to learn and retain the lessons that it teaches. Valuable skills like careful planning, preparation, hard-work, diligence, patience and sharing have to be found some other, more artificial way—almost always loosing something in the process. If these values are going to be reaped in our communities, businesses or families then we must first do the all the necessary work required to cultivate them within ourselves. In my opinion, we’ve been given no better template for success than the garden. First, we have to have worthwhile goals—things that we want to accomplish or overcome. These are the seeds. But before those seeds can ever develop or yield fruit there is a lot of preparation work that has to be completed. We can’t sow our dreams among brambles and expect it to ever produce good fruit. Instead, we must have the applied courage to bust the soil and rake out the garbage (negative attitudes, excuses, addictions and unproductive thinking etc.) and thus create the powdered canvas by which we can grow our own masterpiece. I think that our Designer/Creator understood that we needed a “hands on” example—a classroom in which we could play, experiment and get some dirt under our fingernails while finding out truly what works in life and what doesn’t. The garden is perfect for that. Anyway, that’s why I really love this time of year—it’s gardening season! That means I’m back in school for another action packed semester. I wonder what I’m going to learn about this year? I’ll tell you what—go grab your work gloves, come join me and we’ll find out together? Now bring on the bugs and weeds! This year I’ve already been killing those nasty Colorado Beetles! And the garden wasn’t even planted yet!! They were reading my mind, waiting for me. And last night I had to water the garden just so I could go out at 6am to weed! The ground was that hard from all this heat! Yes Mike we start as a seed and grow,we learn to deal with weeds along the way,so that we may become perfect. Very great keep it up! I love it!! You are awesome at this! Ok, so you have my attention (well you had it with the first one…lol) and it was hard getting to the end since I wanted to read more! Awesome job! !